The Mekong Delta is the southernmost region of Vietnam, with the population of approximately 20 million people, total area (excluding islands) of about 4 million hectares; of which about 2.60 million hectares are used for developing agriculture and aquaculture. The Mekong Delta is particularly important for the overall development of the country. However, in recent years, under the impacts of global warming Intergovernmental Panel on Climate Change has defined the Mekong Delta is one of the three most vulnerable plains due to climate change, sea level rise, and land subsidence. Especially, the impact of water resources exploitation of upper Mekong countries has been causing great challenges to the sustainable development of the region. Recognizing the nature and development trend of the Mekong Delta, new threats and challenges that helps to form scientific bases for development model and solution for the region in accordance with the evolution trend of the nature and time being is very important. This article presents assessments on the challenges and strategic viewpoints in regard to sustainable development and adaptation to climate change of the Mekong Delta. Water is an essential resource for life, for human health and for ecosystem, which is also the most important factor of all nations in socio-economic development. The identification of minimum flow (DCTT) to ensure the minimum level that is necessary for maintaining the river/ river segment, to ensure the normal development of the aquatic ecosystem and to ensure the exploitation and utilization of the water resources is necessary and urgent. In this paper, the author presents some results of calculating the minimum flow for Vu Gia - Thu Bon river system based on the integrating of hydrological, hydraulic and ecological factors. Key words: Minimum flow, Vu Gia - Thu Bon. Piano Key Weir (PKW) was the spillway that had the zigzag crest sharp, creating keys same as keys of the piano. The flow on inlet and outlet keys had different characteristic depending on water head, which affects the discharge capacity of PKW and downstream flow. This paper presents characteristics of flow on the PKW from the results of the physical experimental model and 3D numerical model.Accordingly, analyzing, defining the full regime and incomplete regime of outlet key with the boundary value was Hu/Wo=0.5, The downstream flow form along the input key is falling flow, along the output key is the bottom flow. The bottom flow rate accounts for 80% ÷ 90% of the total flow of the PKW. Keywords: Piano key weir, characteristic flow, physical experimental model, 3D numerical model. 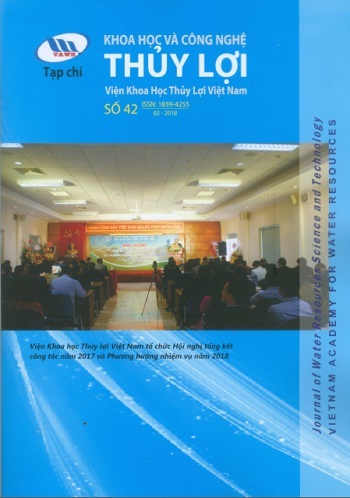 Within the framework of the ministerial-level research project: "To research and propose appropriate technology solutions to against coastal erosion and estuary for the region from Ho Chi Minh city to Kien Giang " the authors have studied the wave reduction effect of the of the offshore breakwater configuration in the wave basin model for coastal area of Vinh Chau, Soc Trang province. This paper presents a summary of the study results with 78 experimental scenarios for different offshore breakwater configuration with different water level and wave parameters (random waves). The experiment results will serve to define the layout of the offshore breakwaters in accordance with the natural conditions of the each area. The California Bearing Ratio (CBR) test is used to evaluate the capacity bearing of road pavement. CBR test has been widely used in Vietnam and in the world as well. However, this test requires relatively high cost and time-consuming. Thus, Clegg Impact Soil Tester (CIV) which is simple and lightweight structure, cost-effective, time-saving, and high accuracy, has been developed to replace the CBR test in some countries. In order to meet the requirements of design and inspection standards of the road, it is necessary to find a correlation between the CBR and CIV indexes. In this study, both CBR and CIV tests are carried out on the road base in Dak Nong province under the same experimental conditions. By comparing the test results, a correlation between the CBR and CIV values is proposed, CBR=2,024e0,085CIV. This correlation could be considered to apply for similar geological conditions. Key words:CBR test, Clegg Impact Soil Tester, Basalt Soil, Central Highlands. Biological landfill that adopts a "zero emission" (zero landfill) approach has been studied and applied successfully in several countries, such as the United States, Japan, Denmark and Slovenia. In this study, the incorporation of landfill biomass with the technology of fully absorbed and evacuated air into the air using vegetation cover on the surface of the landfill according to the “green landfill” model which has been studied in the laboratory conditions and piloted in Dai Dong, Hung Yen province. The Research results have clarified the superiority and applicability of green landfill models to small urban areas in Vietnam because of low cost, high efficiency and reduction or "zero emission" of pollutants to the environment. Key words:Green landfill, solid waste, environmentally friendly, energy saving, waste treatment. Experimental research on soil moisture dynamic of drip irrigation technique for Grape leaves in three crop seasons with 3 irrigation frequencies: 2days (CK2), 3days (CK3) and 4days (CK4), at the water scarce region, Binh Thuan province. Moisture dynamic of the soil layers has a distinct difference, water content of the layer containing the active roots (5÷20cm) was smaller than the surface layer (0÷5cm) and the below one (20÷30cm) at the end of the irrigation frequency, the smallest is the layer 10÷15cm: from 11.8÷12.5% (CK2-V3), from 8.1÷8.2% (CK3-V3), 4.7÷4.9% (CK4-V3). At the end of the irrigation frequency, water content of CK2 was still greater than that one at water stress point (θp), water content in the CK3 (except the surface and bottom layer without roots) and the CK4 has decreased lower than θp, it sometimes approached the water content at wilting point (θwp), caused the plant to be deprived of water. Daily soil moisture dynamic was very different in each period, the day water content decreased more greately than the evening and night ones, and the afternoon one decreased more greately than the morning one. The water content decrease was the greatest during 9:00÷15:00, the next ones were in period’s 15:00÷21:00, 3:00÷9:00 and the lowest was in 21:00÷3:00 of the next morning. These studied results have been an important basis for the application to detemine a suitable water-saving irrigation schedule for Grape leaves in particular and for dry crops (similar characteristics) in general in the water scarce region (droughty region) of the South Central part. Keywords: Drip irrigation, grape leaves, irrigation frequency, soil layer, soil moisture. Travinh’s coastline is located in the lower Mekong River which is strongly influenced by changes in sediment load from the Mekong River and in sea level rise due to the effects of climate change. This study uses the Mike 21C F/M model to calculate the hydrodynamic regime and sediment transport in the Tra Vinh coastal zone with 5 scenarios (current status, sea level rise by 2030, 2050 and decrease of sediment discharge from the Mekong 20% ​​- 30%). This article presents the results of the calculations based on the relationship between variation in the depositional layer and time, the decrease of sediment load in the Mekong River and the sea level rise. Boat-generated waves have a potential to erode a riverbank, especially where there is regular boat traffic whereas vegetation might be able to protect the riverbank from that threat. A field observation conducted in Ca Mau Province, Vietnamese Mekong Delta, investigated the interaction between boat-generated waves and vegetation. Two types of vegetation, Rhizophora apiculata, a mangrove species that has dense aerial roots, and Nypa fruticans, a palm species, were considered with respect to wave attenuation. The results indicated that both R. apiculata and N. fruticans play essential roles in dissipating wave energy and therefore have a high potential for riverbank protection. Remarkably, more than 50% of the wave height reduction can be obtained in a relatively short distance inside the vegetation belt. The vegetation porosity strongly affects the wave attenuation. In addition, R. apiculata was more effective than N. fruticans in wave height reduction, even though their porosity is greater. The special aerial root configuration of R. apiculata induces greater drag force that might account for this phenomenon. Small hydropower, especially the pressure-driven hydropower is being invested heavily in Vietnam. For this form of hydropower, the construction of a surge tank is needed to improve the quality of the process of transfer unit and reducing the water hammer pressure in the transient process. The determination of size and structure of the surge tank will bring economic benefits to the project so it should be analyzed and selected carefully. Nowadays, when analyzing the structure of the surge tank, it is often considered that the water pressure in the surge tank is hydrostatic pressure type without taking into account the fluctuation of water level in this. In this paper, the authors focus on the effect of water level fluctuations on the structural analysis of the surge tank. The model is constructed taking into account the influence of the surrounding environment on surge tank. Keywords: Hydroelectric plant, surge tank, hydrostatic pressure, water level fluctuation, transient process. In addition to the continuous emission of contaminants into groundwater at the old cemeteries (or landfills), the lack of treatment measures to prevent and decrease the contaminant transport has caused the concerns of the groundwater quality which is beneath these cemeteries. In this paper, according to the main goal is to remove NH4+ arising from the Con Dao cemetery to Pleistocene aquifer of Con Son Valley, the in-situ treatment of NH4+ (pump and treat measure) is proposed to apply and the treatment process of NH4+ is sumulated on RT3D code of GMS 10. The simulation results show that NH4+ treatment efficiency depends not only on location, quantity and flow rate of the extraction - injection pumps, but also on the fluctuations of groundwater level, namely the groundwater drawndown. Keywords: groundwater model, GMS, contaminant transport.